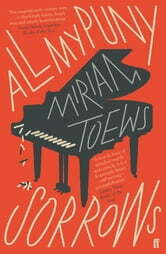 Miriam Toews's All My Puny Sorrows, at once tender and unquiet, offers a profound reflection on the limits of love, and the sometimes unimaginable challenges we experience when childhood becomes a new country of adult commitments and responsibilities. A thought provoking, sad and funny story of family, love and chaos. Raises lots of questions about suicide and euthenasia and how much we should do for love.